Class of 2016 are throwing their mortarboards up in the air at ceremony. HyunChul Park, the recipient of the UNIST Chairman of the Board's Award is smiling in the crowd. Graduation is not an end, but a new beginning. Today, is a day of pageantry, celebration, and ceremony, as UNIST holds its Commencement in the UNIST Gymnasium. 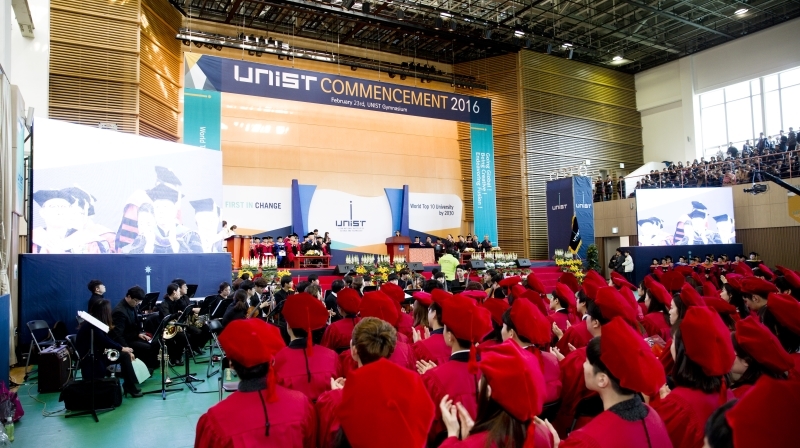 This was the first graduation since the recent status change of UNIST as a government-funded research institute. It was open to families and the general public and included representatives of all degree recipients. The ceremony featured the conferral of degrees, followed by the awarding of honorary degrees, greetings by University Officials and remarks by the distinguished guests, including Mr. Gi-Hyeon Kim (Mayor of Ulsan City), Mr. Hong Nam-ki (First Vice-Minister of Science, ICT and Future Planning), Mr. Young-cheol Park (City Council Chairman), Mr. Bok-Man Kim (Board of Education and Superintendent of the Ulsan City), and Mr. Hyun-Soon Lee (Chairman of the UNIST Board of Directors) to celebrate this special moment of recognition. 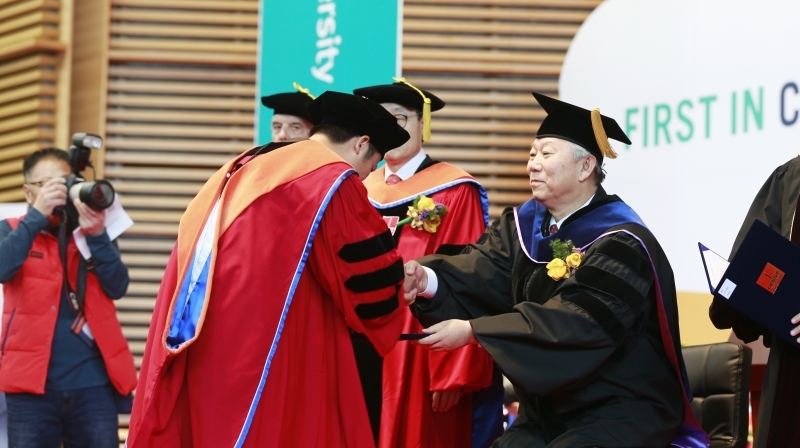 At the ceremony, President Mooyoung Jung awarded 44 honorary Doctoral, 105 Master’s, and 509 Bachelor’s degrees to students graduating after the completion of the winter semester. It turns out, since its opening in 2009, UNIST has a total of 1,717 graduates in science and technology, including 44 Doctoral, 337 Master’s, and 1,291 Bachelor’s students. Award recipients of 2016 Commencement are posing for a portrait after the ceremony. From left are Hee-Sub Shin, TaeHoon Kim, HyunChul Park, Min Ji Ko, and Yi Young Kim. At each convocation ceremony, UNIST recognizes the exceptional achievements of outstanding students through various awards. As a recent February graduate, HyunChul Park (School of Energy and Chemical Engineering) was awarded the UNIST Chairman of the Board’s Award, a prestigious award given annually to students selected by the UNIST administration. Mr. Park is the first UNIST student who has passed the Public Administration Examiniation. He is currently working for the City of Daegu. At the ceremony, TaeHoon Kim (School of Electrical and Computer Engineering) received the Minister’s Award of MSIP, Yi Young Kim (School of Natural Science) received the Mayor’s Award of Ulsan City, Min Ji Ko (School of Business Administration) received the Governor’s Award of Ulju-gun, and Hee-Sub Shin (School of Materials Science) received the President’s Award of Kyung-Nam Bank. 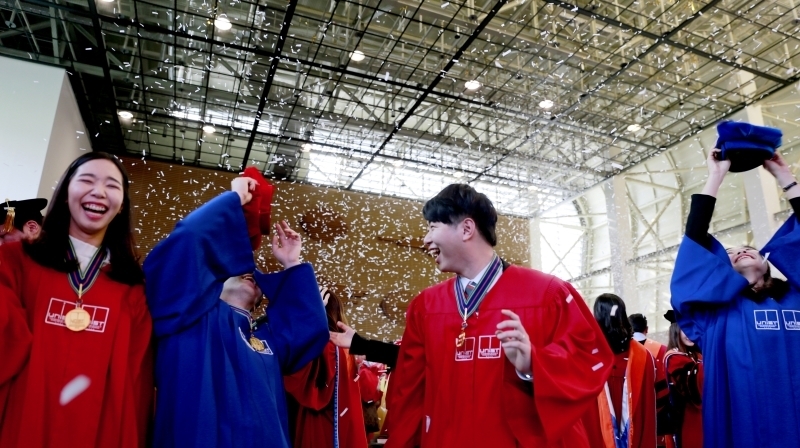 Also, UNIST President’s Awards were given to two students, Ho Young Jung (School of Natural Science) and Ji Yong Yang (School of Business Administration) who have shown academic excellence.